Free Shipping *In Stock 1/1/0001. Pre-Order Today! In Stock. Ships within 1-2 business days. Check it out. Our best-selling loafer is now available in fresh spring leathers! 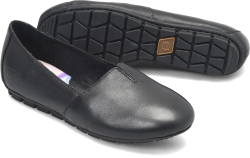 The versatile MALENA is crafted from supple leather with a cushioned footbed. It's perfect for workwear, travel, and everything in between. If you are unhappy with your order you may return your purchase within 30 days of shipment for a refund or exchange. Shoes must be in original, unworn condition to be accepted for returns/exchange (unless defective). Beyond 30 days, our products are guaranteed against defects and workmanship. Merchandise Return Form to be filled out. Returns & Exchanges information with instructions for either a return or exchange. UPS Pre-Paid Return Sticker for your convenience. No shipping charges will be applied to exchange orders. Straight returns are charged a fee of $6.95 if the UPS Pre-Paid Return Sticker provided is used. The cost of shipping an item to us is the responsibility of the customer. (Note: exceptions to this policy are made for defective items). For more information see our Customer Service Page or if you have any questions, please call us at 1-866-979-2676 or email us at customercare@bornshoes.com. Yes. This flat is so soft and comfortable. I bought the pink last summer in size 6.5. I usually wear a 7, but the reviews said size one-half size down & I am glad I did. No break in period. Great shoe for late spring, summer & early fall. Yes. I love these shoes. When I can afford another pair ,I'm getting the tan or black. Yes. These are my casual go-to shoe for every look. I've worn them out & have reordered in many colors. They were comfortable right out of the box. Yes. Had these for 5 years now. Still comfy AND they really last Excellent craftsmenship. Yes. Tried these shoes with several others and these definitely stood out. 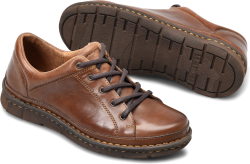 Soft leather and supple fit. They feel like gloves for my feet. However, has anyone else had problems with squeaking? They are noisy shoes Any suggestions? I don't want to take them back because they are so comfortable. What can I do to minimize the squeaky noise? Yes. I just purchased my 4th pair of these shoes. I have a hammer toe on my left foot so buying shoes is not as fun as it used to be....until I met Born Shoes. I have bought 4 pairs of boots and 4 pairs of the Malena shoes. My feet are SO happy. Thank you Born. Yes. So I bought the gold ones. I Love Them. Trying to decide what other color I want. Yes. I love the color Rosa I ordered the half size smaller, too small, had to return them. Unable to get my regular size in the color I wanted so I order on another site. The leather is very soft I'm sure I will love them. I love born shoes, great quality , comfort and style. Yes. 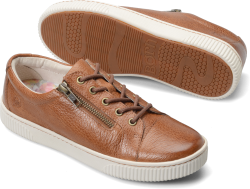 I love the butter softness of the leather no break-in time needed. I was glad to read to order a half size smaller, as the smaller size fit perfectly. Yes. These run much smaller than their other styles. Yes. Bought these shoes for a birthday gift. Yes. Super comfortable the softest leather ever and the perfect addition to my shoe collection. Received non-stop compliments Very satisfied with my purchase. Yes. The Malena does run a half size too big - as reported by others. I had to return for the next size down. The leather is beautiful and style is exactly what I was looking for. Suggestion dark brown leather would be a great addtion to the colors. Yes. Very comfortable leather is so so soft. I'm going to have to have the black ones now. Yes. I love these shoes They are comfortable and super cute. The can easily be worn with jeans or dress slacks. Yes. I was looking for shoes like this. Could not see justifying the price to buy Tod's google to see....they look almost identical to Tod's drivers. I originally purchased in size 8 my normal size but had to exchange for 7.5 as others have mentioned they run large. 7.5 fits perfectly. I bought in two colors. They are so soft flexible and comfortable exactly what I was looking for. Can buy 4 pairs for the cost of one pair of Tod's. Appear to be well-made. I will buy again. Yes. Just got these yesterday they fit beautifully and no issues for break in or size not fitting. Yes. Soft as butter and super comfortable. Yes. For my sensitive feet these are the best shoes ever. I hope you continue to have loafers. Yes. I loved the shoes They are beautiful very well made and extremely comfortable. I ordered a 7 1/2 which is always my size and these were about 1/2 size too long so I had to return for a smaller size. I have not received the new pair but hopefully the new ones will fit. Yes. 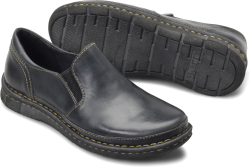 The leather is like butter The most comfortable slip on shoe I own... definitely my new commute and travel shoe. Note I did have exchange for a half size smaller. Yes. comfortable except they slip a bit - too wide. I would like to have inserts in these shoes. Yes. I am always very happy with my Born purchases. The quality is excellent and the comfort is terrific.